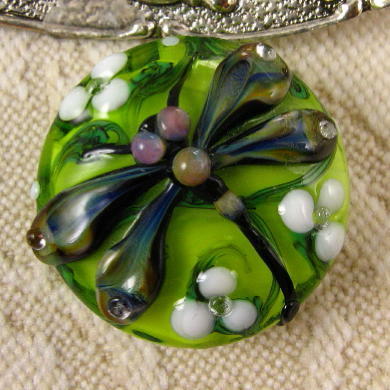 My name is Kerri Fuhr and I am a full time lampwork glass bead artist living in British Columbia, Canada. 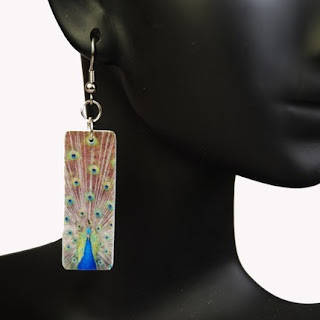 Using a tabletop torch, rods of glass and a few hand tools, I sculpt detailed focal beads and ornate bead sets for jewelry designers and collectors world wide. 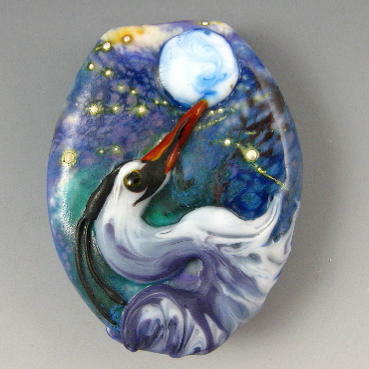 I am inspired by nature and many lively creatures are depicted on my beads! Dragonflies, honey bees, ravens and herons are among my favorite subjects and with each bead I create I strive to capture their character and spirit. 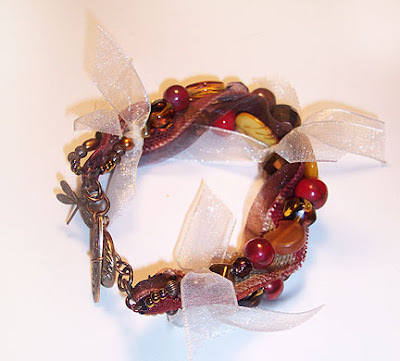 Rich colors and delicate tapestry - inspired scrollwork also decorate many of my beads - the more detail and color the better! 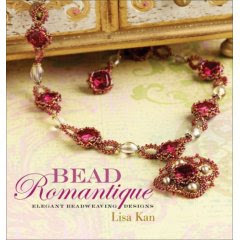 New designs are featured often so be sure to check out my blog for daily updates and fun new beads! 1. 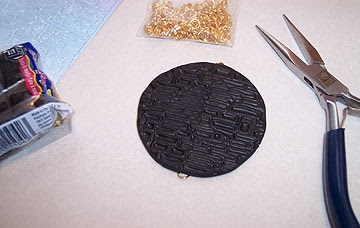 Stamp black polymer clay with a texture plate. Cut slits at both the top and bottom for jump rings and gently mold the clay closed around them. Bake according to the directions for your brand of clay. 2. 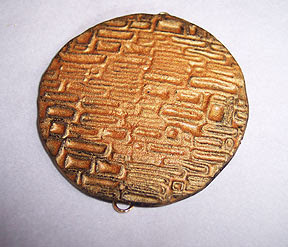 Mix liquid sculpey with gold mica powder. Wipe it all over your clay and let it settle in stamped parts. Rebake. 3. Sand the surface with fine sandpaper to remove mica from the raised surface of the texture. Now the piece will look like a mosaic with black grout! Add another thin layer of plain liquid sculpey to the surface if desired and bake one more time. 4. 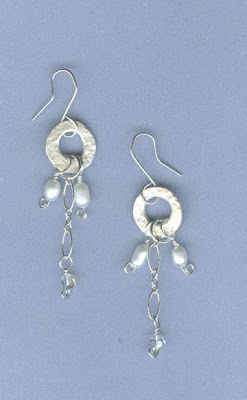 Create dangles to attach to the bottom jump ring. 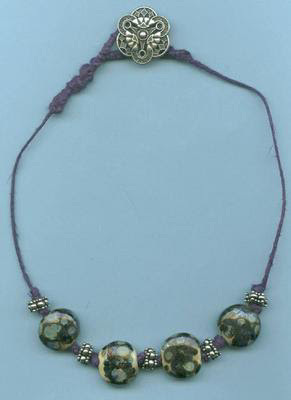 I kept the middle bead “floating” by using a small crimp on the headpin. 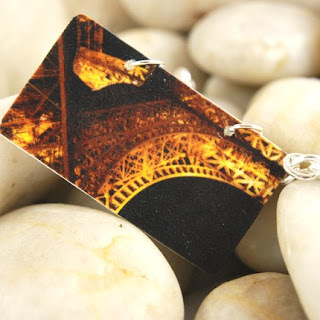 Use Diamond Glaze or E6000 to glue brass stampings or other charms to the pendant surface. Add a large jump ring or bail to the top. 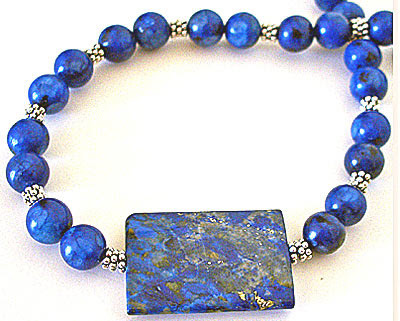 My designs consist of one of a kind and limited edition pieces. 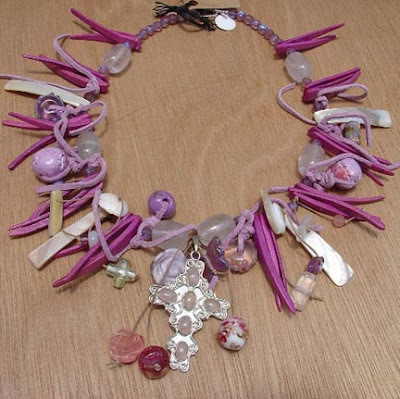 I pride myself on the ability to find individual, distinctive and truly unique components to incorporate into my designs to make a special creation. 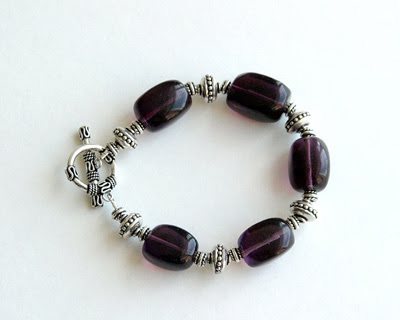 My designs are contemporary and timeless and can go with any outfit. 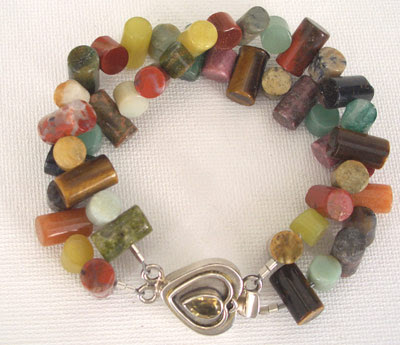 As far as my creative process, I choose my pieces because I like the different shapes of the stones, color, and texture. I don’t always have a specific design in mind when purchasing my components. It could be months later when something hits me. At that point, I will know exactly what I want to do with it. I don’t sketch out my designs. I like to put everything on the board and let it evolve from there. 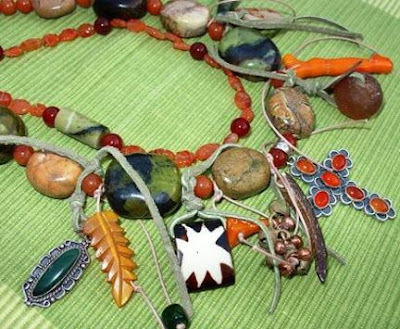 I think its fun to play around with the different stones and try to balance all the components to compliment one another. I usually have the TV on while I am working. Not necessarily listening to what is on but more for background noise. If not the TV, then I am listening to my iPod library of songs. Sometimes I can work for hours at a time. It depends on what I am creating and what my deadlines are. My training consisted of someone giving me a “crash course” in basic jewelry making. In addition, I have taught myself various techniques and I am always looking to take classes, learn new things and advance in my skills. I seem to gravitate more toward the colors of nature and everyday life. There are so many different things during the day that can inspire you. For example, just looking through magazines or even watching TV. I also spend many hours searching, planning and designing for each “collection” piece. To find these pieces, I search for them from all corners of the world. 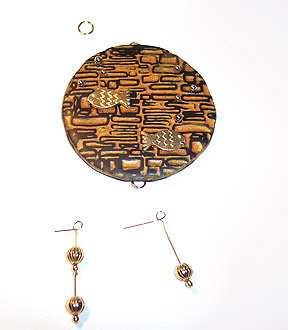 I am always searching for that “special piece” to incorporate into my designs. To me, all of the above play an important part in what inspires me in designing. What inspires you to keep going or when the work gets frustrating or tough? When I hit a creative road block or get frustrated while working on a piece, I usually put it aside and start to work on something else. After a while, I go back to the piece that I have put aside and have a different prospective now to work on that piece. Sometimes just clearing my head from that design helps me a great deal. 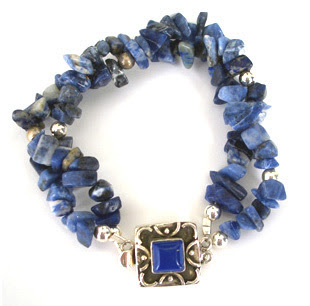 The handcrafted jewelry business is extremely competitive. It takes a lot of work, time and determination. If you want to succeed, you have to be persistent. The creative aspect is only one side. The business side is also another area that is often overlooked and is an important aspect. I have a teenage daughter who plays soccer in school and on a traveling team. We are busy with soccer year round which takes up a considerable amount of time. I try to set aside time for work and family and balance it as much as possible. I have two favorite comfort foods, Cuban and Indian. 1. Pick the items that you will use for your pin and decide on a layout. Do any preparation work necessary (eg, I had to saw the back off of the Mahjong tile because it was too thick to embed well). 2. 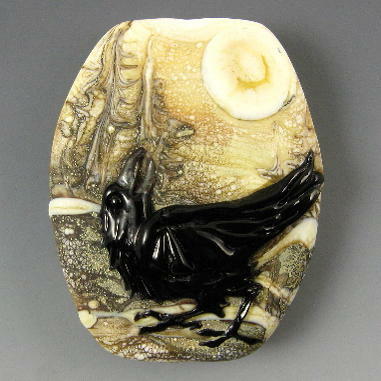 Condition and roll out a lump of black polymer clay on parchment paper to approximately 1/4 inch thick. Use a rolling pin or a clay-dedicated pasta machine. 3. Lay the pieces onto the sheet of clay and sink them down into it. Remove the pieces before baking. 4. Cut the polymer clay edges with the exacto knife, leaving a narrow border around the objects you’ll embed. Smooth the edges with your fingers. Cut a slit in the top and bottom edges with the exacto knife and insert a jump ring half way into each slit. Smooth the clay closed around them. Texture the top surface with a rubber stamp if desired. 5. Bake as directed on top of a cookie sheet lined with parchment paper. Exact times and temperatures vary depending upon the brand of clay used. 6. 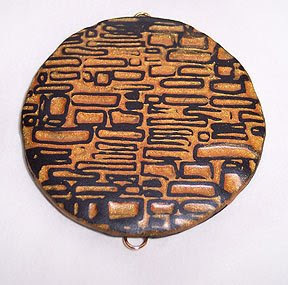 After the pendant has cooled, use a small paintbrush to apply either 2-part epoxy resin or a clear coat finish like Diamond Glaze. Anchor your decorative pieces in place and coat the top with a thin coat. Let it dry thoroughly. 7. 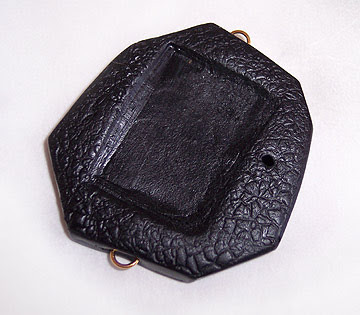 To assemble and wear your pendant, attach another jump ring or a bail to the top. 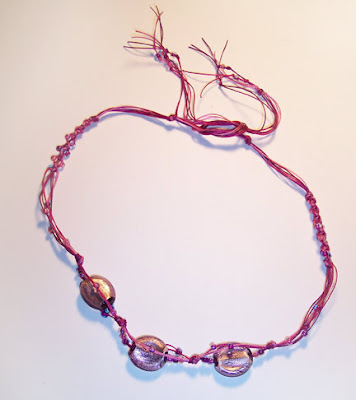 Place some beads on your head pin and create a wrapped loop around the bottom jump ring. 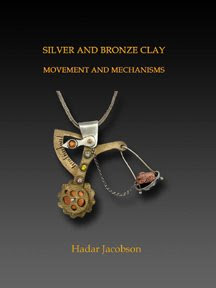 Having taken part in several really wonderful collaborative projects, I was immediately drawn to this book. All of the wonderful wearables shown in it are the results of round-robins, collaborations, and swaps. It’s amazing how much time and energy it takes to organize just one of these projects, and here is a book that is full to bursting with…well, they claim there are 25, but I swear there are more! The projects aren’t overly detailed with exact counts and sizes. 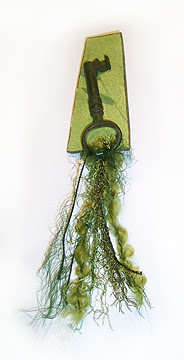 For some that may be frustrating, but it’s just the nature of working with found objects and mixed media. Know that going in: you’ll find lots to inspire you here, but if you’ve got to have everything spelled out completely, you’ll want to borrow rather than buy this book. For everyone else…buy it! Quick! Beth, how do you describe your work? I’ve always been a photographer, and one day I had this epiphany that I needed to combine my photography with jewelry in order to create some really bold, modern and graphic pieces. Basically the kind of stuff I like to wear. 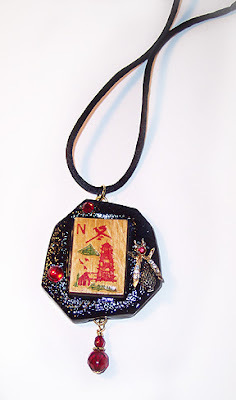 All the images that appear in my jewelry are my original photographs that I transfer to thick plastic and hand cut, shape and wire. When first creating the line I wanted a name that would reflect the uniqueness of the original photography while still sounding modern and intriguing. Thus, Diffraction was born! Well this is really a two part question for me. The photography aspect of it happens in chunks, my husband and I will go on roadtrips, trips abroad or sometimes just to our local farmers market and I’ll capture things that inspire me. New product lines tend to be epiphanies, I’ll be walking down the street and think I HAVE to make nightlights with my photos (coming soon!). I have to keep an ideas journal with me at all times because I really have a horrendous memory. 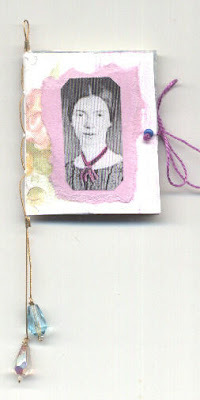 So new products come flipping back through my journal and creating. Besides my camera it’d have to be needle nose pliers. 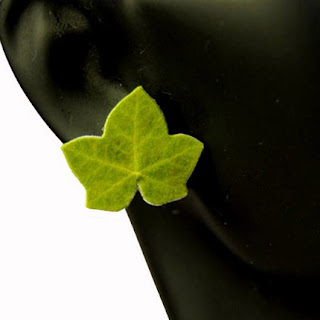 They are just indispensable for all sorts of details and wiring. Not terribly exciting, but necessary! The world around me! I love looking at the details of ordinary objects, up close and personal. Playing with angles and looking at things in a whole new way, which you’ll see in a lot of my pieces. We see so much ugliness in the world through the eyes of the media. I want to give an alternate look, a look of beauty. Chocolate! Well, that and I have a wonderful support system of family and friends who encourage and believe in me. It’s so helpful to have artistic and crafty people around you who are going through the same things. Stay true to yourself and your aesthetic. I see so many people trying to follow what’s “hot” and it tends to make for a lot of similar work out there. And don’t sell anything that you are not proud of, ever. You are nothing without your reputation as an artist. I absolutely love to cook! Having friends over with some good food, fun conversation, and a great bottle of wine. There is no better way to relax. Sushi, sushi, sushi. I’m pretty sure I could eat it just about every day, you know, if it wasn’t so expensive. When my husband and I met he hated sushi. I told him that just wouldn’t work for me. Slowly but surely I’ve gotten him to expand his love of raw fish. It’s been a pet project, and now he loves his tuna and cream cheese rolls. If only I could get him to try some eel! 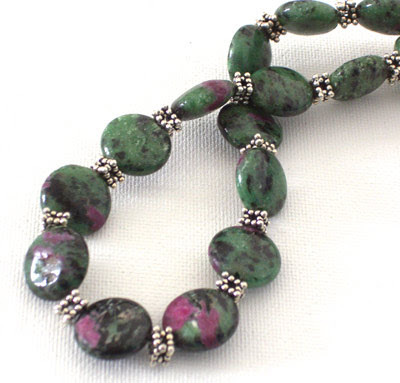 Location: at a bead show, preferably, but in West Covina, CA when not. Phaedra, how do you describe your work? 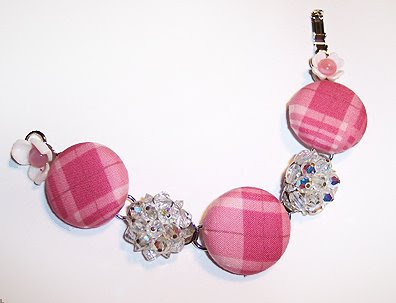 I usually like to say that I specialize in “unwearable” jewelry. Mostly because it’s the easiest way to describe it, and partially because I just like to see people’s reactions to that. When I tell people I make jewelry, I usually add the disclaimer of “but not normal jewelry” because I can see the pictures forming in their heads of the jewelry they think I make. If I don’t steer them away from that image, they usually don’t know what to say when they actually see some of the junky crazy stuff I make. I spare us both the pain. Lluvia Designs was born because I always liked the name and decided that if I had children, one would be named Lluvia, which means “rain” in Spanish. Well, I decided not to have real and human kids, so the name was adopted by my jewelry. I sometimes have an idea for a piece of jewelry rattling around in my head, but mostly I just pull out beads and they magically arrange themselves. I’m not that disciplined and very rarely plan and sketch out an idea. I grew up in a loud family and am loud myself, but strangely, when I’m being creative I like silence, so I usually don’t play music. I like working at night while everyone else is sleeping, and I talk to my dog (and myself) about what I’m making. I really haven’t had any formal training, mostly informal “on the job” training! I’m not a very good student, unable to sit still in jewelry classes for long periods of time, so I’ve mostly learned by myself, and by trial and error. 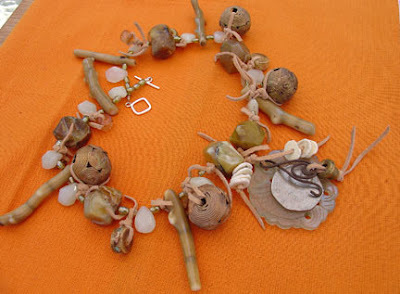 I remember making jewelry “to sell” and I felt very much under pressure, always wondering if it would sell, would people like it, is it fashionable right now, etc. A little over 4 years ago I took a big risk and quit my comfy, familiar full time job, traded it for a part time job and began making jewelry full time. 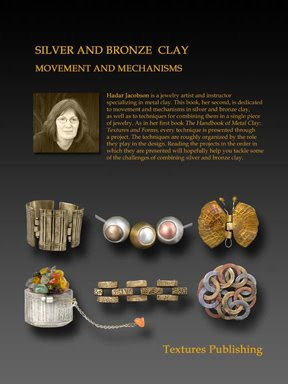 I knew I had to stand out, so I challenged myself, and I saw my jewelry morph into what it is today. 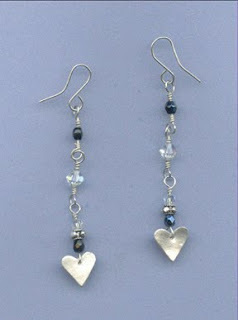 I stopped making jewelry “to sell” and started making jewelry that came naturally from me. Beads, of course! I use a lot of suede lace, so I’d be hurting without it. If I couldn’t fish through my boxes and boxes of found items, collected over the years or handed over from my mom, I would seriously be hurting…like “I need a margarita” hurting. 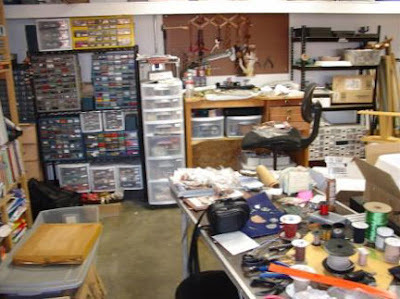 I can’t pinpoint what inspires me to create, only that something leads me to my workspace in my garage and holds me captive there for hours on end. I’m very drawn to things I find in the street. I love to look on the side of the road for discarded gems. 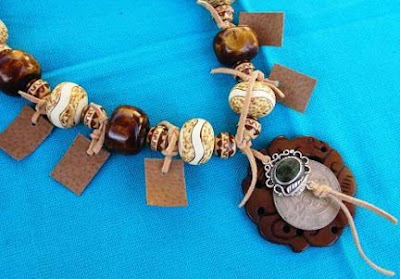 A simple bottle cap will inspire me and a necklace will be born around it. 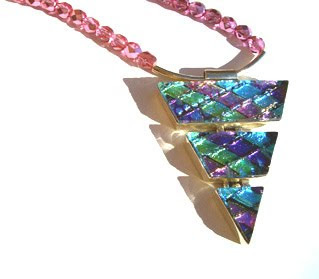 I still remember what initially inspired me to make jewelry. When I was about 15 years old, my mom, who makes quilts and other sewn objects, had a booth at a small craft fair – and I was recruited to help her. There was a girl in the booth next to us selling jewelry and my mom bought me two pairs of earrings. After taking them home and inspecting them, I decided I could do it myself. And the rest is history. 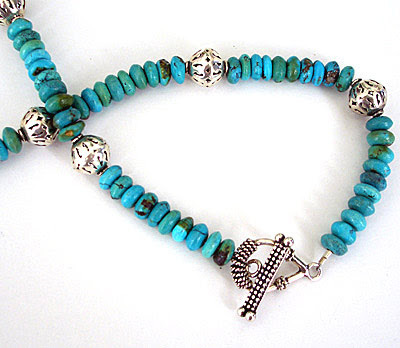 The beaded jewelry business can be tough, because there are so many of us out there. I focus on what pleases me. It’s very selfish, I know, but it works. Challenge yourself. Take a step back, look at your work, does it “wow” you. Are you amazed? Forget about what you think will sell or please the masses, challenge yourself to make something above that, something that takes your breath away, something that you can’t stop looking at, something that you are truly EXCITED about, something that doesn’t let you sleep at night. 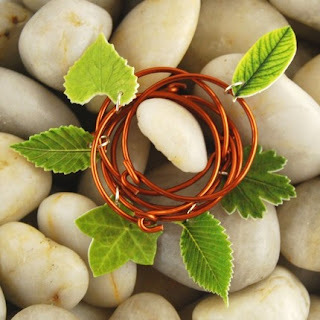 Use materials that you wouldn’t normally use. Sometimes we buy materials and supplies we’re familiar with and it leads to the same types of designs over and over. It wasn’t until I stepped away from certain items I used over and over again that I was able to really experiment and develop my style. I’m lucky that I only work part time right now, it leaves plenty of time to wander the world. I work in my garden, take my dog on hikes and walks, and travel. I took a 3 week trip to the Yucatan with my sisters this past summer. I always read voraciously and I like to grill things. I love traditional homemade Mexican food (believe me, it’s not the stuff you’re eating in restaurants!). There’s an Indian place I crave on a regular basis, which requires a drive through L.A. traffic, but so worth it. I’m lucky to be surrounded by so many great Asian restaurants here, so I have my choice of Chinese, Korean, Japanese, Malaysian, Vietnamese, etc. I love my job, my dog, my tortoise, my family, public transportation, and playing with clay. 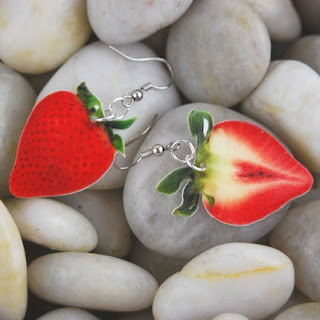 Sherri Haab knows jewelry. 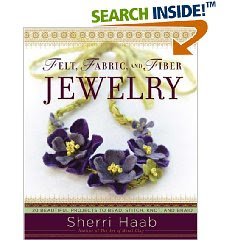 Sherri Haab knows fiber and fabric. 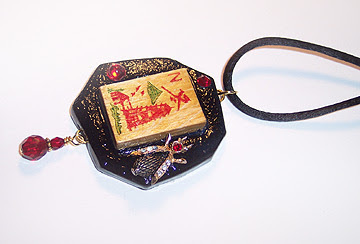 Sherri Haab knows crafting. Is there anything Sherri Haab can’t do? Frankly, no. She’s the Superwoman of crafting books! That’s it in a nutshell! 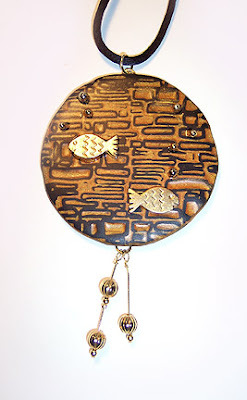 I have drooled over Sherri’s resin jewelry and her work in metal clay, and now she throws me this curveball by working in soft maleable materials that I just didn’t expect. 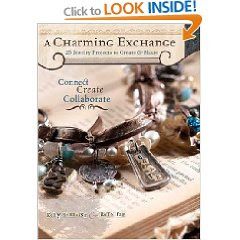 Some of the pieces in this book are elegant, some are funky and whimsical, but all of them are pure Sherri-creativity! Inspired by art history, this step-by-step guidebook features 17 designs influenced by the Gothic, Renaissance, Victorian, Art Nouveau, and Art Deco eras reinterpreted in the artist’s distinctive, contemporary style. This is not a book for beginners, although if you are ambitious enough, by all means give it a shot. The inspiration alone from this book could be the push you need to get you into more challenging work! 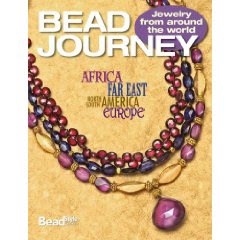 Don’t forget to check out The BookShop from time to time for more great bead and jewelry books. 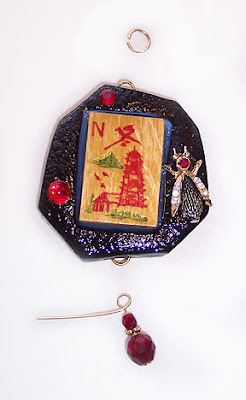 One of the things I love most about making these pins is that you can cut out a bunch of base pieces all at one time, and then you can spend a little time here and a little there putting the pins together using whatever little scraps come to hand. Or are lying around on top of your work table! There are lots of materials that you can use for a base, but one of the easiest to work with is good old Foam-Core. 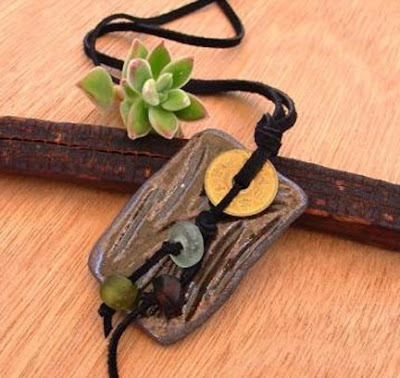 It’s easy to cut, you can stick wires into it to embed things if needed, and it can be toughened up when you’re done by a coating of two-part resin. Like I said, I usually cut out a bunch of pieces in one session, and then work on them little by little. This particular pin is called The Key to My Heart, and it features an antique skeleton key, some origami paper, a couple strands of fiber, and a couple of beads. 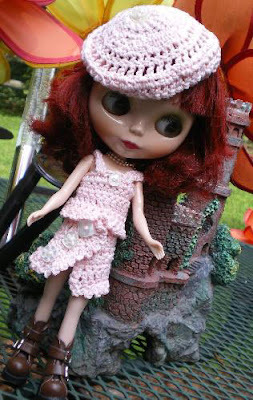 Here’s how I made it…change the directions to suit your own projects! If you want a skeleton key and don't have a real one, there's a cute one you can get from Beadaholique. 1. Peel the upper layer of paper off the top of your Foam-Core base. Paint the piece front and back, and adhere a piece of decorative paper to the front. Use a gold-leaf pen to do the edges. 2. 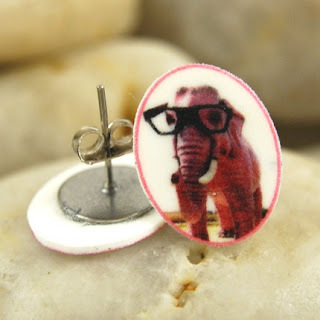 Use epoxy resin to glue heavy items like the key onto the pin front. It leave a glossy area if it leaks out from below your items, so clean it up while it’s still wet. 3. 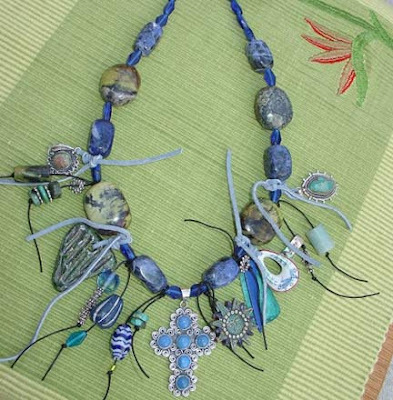 Attach fibers and beads to the bottom of the piece. Since the key had a natural opening, I tied a lark’s-head knot around it. 4. 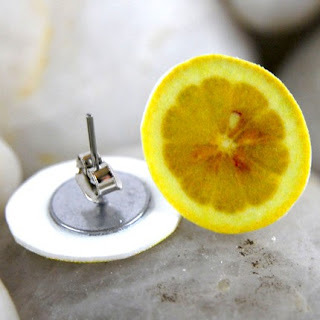 Flip the pin over and use resin to attach a pin back. 5. When all glue is completely dry, give the pin a coat of resin to toughen up the Foam-Core. For this pin, I only did the back since I wanted a matte finish on the front. For others, I do both sides, letting one dry completely before attempting to turn it and do the other. Ohmygosh, never before have I wanted so much to leave my boring world of glass and gemstones and get into plastic and resin!! 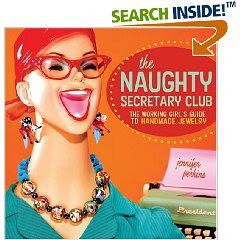 Jennifer Perkins has written a totally delightful book, full of naughty kitschy fun (naughty because she was making jewelry back when she was supposed to be collating and filing. Well, who can blame her? These projects are WAY more fun! If you don’t have a sense of humor, leave this book right on the shelf. Jen invites us all to not take ourselves seriously, and I found it to be a breath of fresh air :-) Her projects are marked as to difficulty, and in an attempt to get my feet wet in kitsch, so to speak, I made this fun fun fun bracelet, which I have unimaginatively named Cloth and Sparkle. I’m boring, so sue me!